Click here for Ridership Trends for the month of December 2018. Click here for Ridership Trends for the month of November 2018. Click here for Ridership Trends as of September 30, 2018. Click here for Ridership Trends as of July 31, 2018. 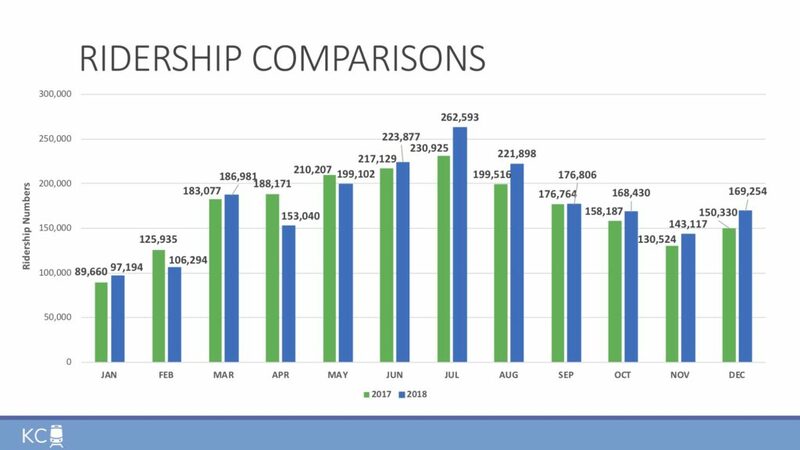 Click here for Ridership Trends as of May 31, 2018. Click here for Ridership Trends as of April 30, 2018. 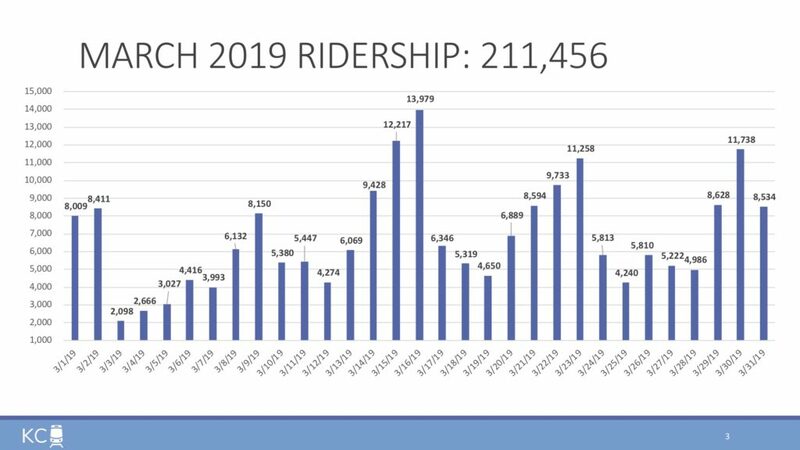 Click here for Ridership Trends as of March 31, 2018. Click here for Ridership Trends as of February 28, 2018. Click here for Ridership Trends as of January 31, 2018. Click here for Ridership Trends as of December 31, 2017. Click here for Ridership Trends as of November 30, 2017. Click here for Ridership Trends as of October 31, 2017. Click here for Ridership Trends as of September 30, 2017. Click here for Ridership Trends as of August 31, 2017. Click here for Ridership Trends as of July 31, 2017. Click here for Ridership Trends as of June 30, 2017. Click here for Ridership Trends as of April 30, 2017. Click here for Ridership Trends as of March 31, 2017. Click here for Ridership Trends as of January 31, 2017. Click here for a listing of ridership numbers by date from May 6 – December 31, 2016. Total ridership for 2017 was 2,060,327 rides. An average daily ridership of 5,645. May 6, 2017 – December 31, 2017 saw a total of 1,446,390 rides, as compared to May 6, 2016 – December 31, 2016 with 1,399,153 rides. In Fall 2017, the KC Streetcar team conducted a ridership survey. Read more about the results here. The full 2017 KC Streetcar and Main Street MAX On-Board Survey Methodology. 2017 KC Streetcar and Main Street MAX On-Board Survey Methodology Report. From May 6, – September 6 2016, the streetcar completed 835,878 passenger trips along the route. During the month of June 2016, 182,248 rides were completed. On the July 4th 2016 weekend, 30,391 rides were completed. The largest ridership day to date was July 6, 2018, when 19,181 rides were completed in one day. During the month of July 2016, 233,683 trips were completed. During the month of July 2018, 262,593 trips were completed. The highest ridership month to date. During the 4 day Labor Day Weekend, 42,913 passenger trips were completed. 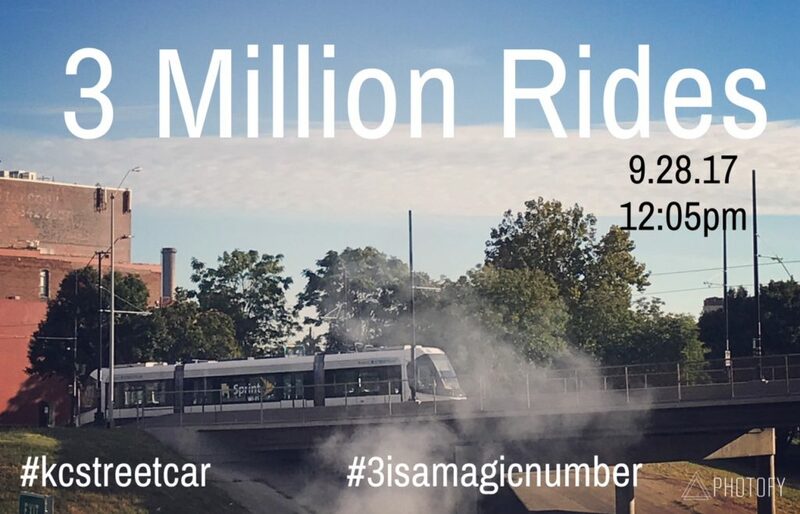 On October 7, 2016, 5 months after streetcar operations began, the KC Streetcar logged in its 1,000,000th ride. This occurred at approximately 1:30pm on Streetcar #803. 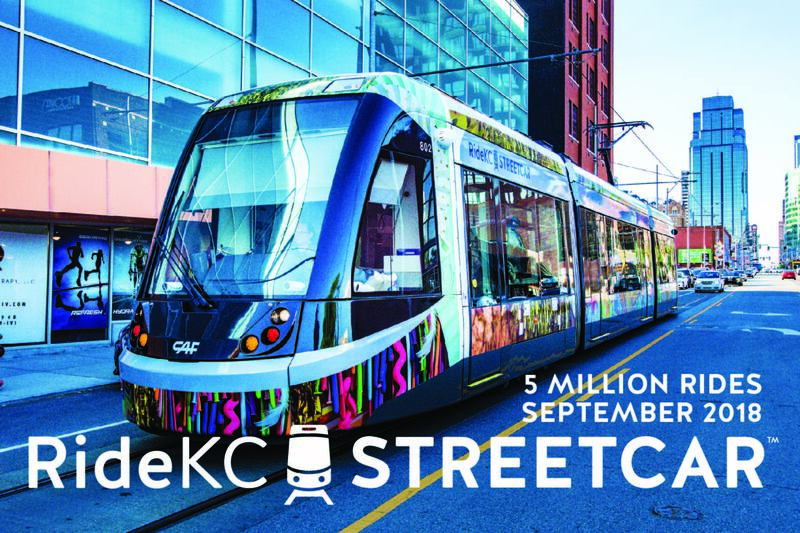 During 2016, the KC Streetcar completed nearly 1.4 million trips. 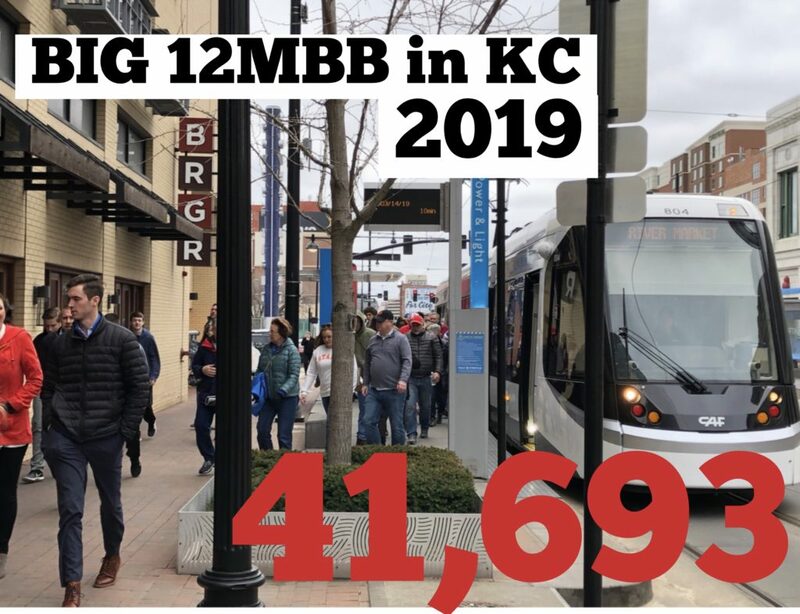 During a Saturday in February 2017, the KC Streetcar completed 13,384 trips. 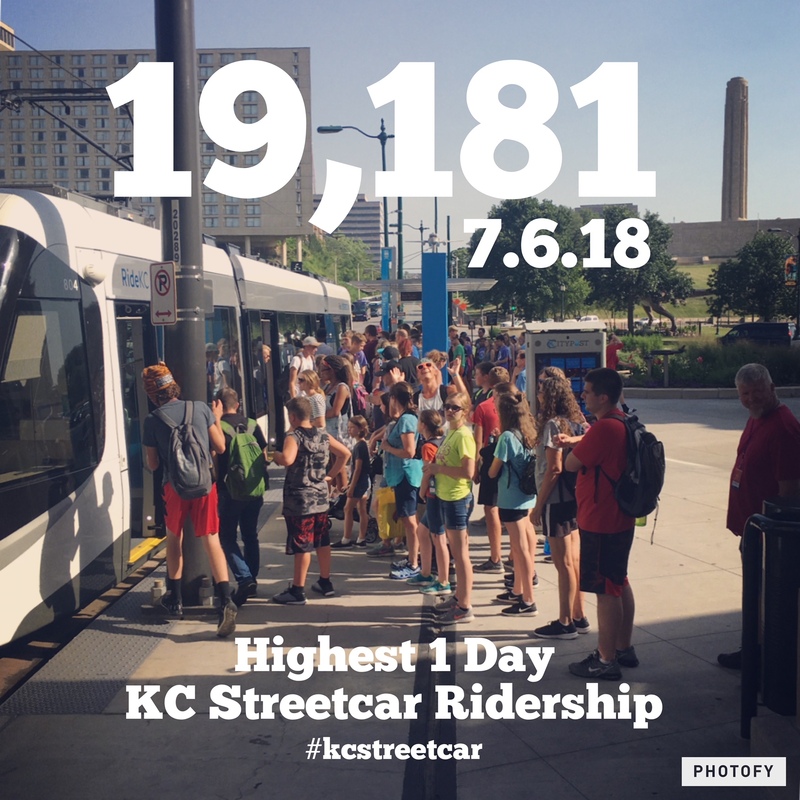 On May 6, 2017, one year since the opening of the KC Streetcar, the system completed 2,000,000 trips. 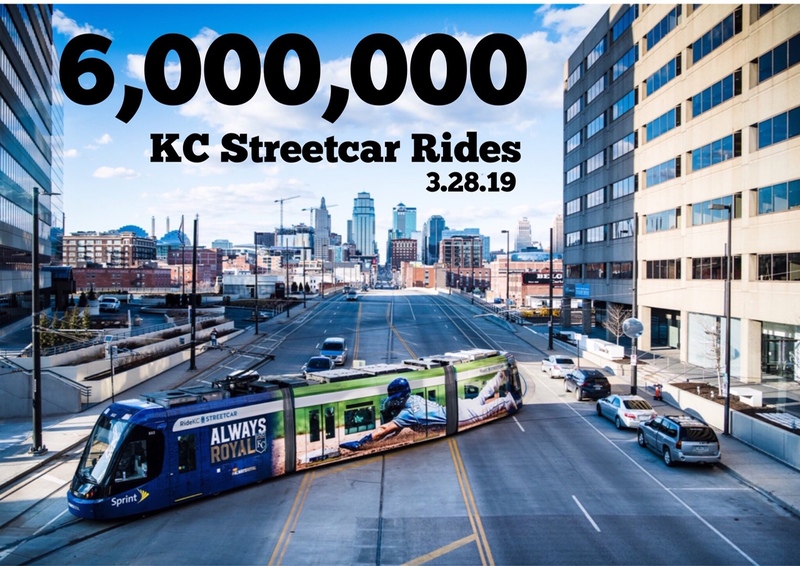 On April 28, 2018, the KC Streetcar completed 4,000,000 trips. On September 15, 2018, the KC Streetcar completed 5,000,000 trips. The KC Streetcar Authority monitors and tracks daily ridership on board the KC Streetcar. Streetcar ridership, otherwise known as “Unlinked Passenger Trips”, is the national standard used by the Federal Transit Administration (FTA) for calculating usage on public transportation systems across the county. FTA Definition of “Unlinked Passenger Trips” (UPT): The number of passengers who board public transportation vehicles. Passengers are counted each time they board vehicles no matter how many vehicles they use to travel from their origin to their destination. KC Streetcar ridership or UPTs is calculated by Automated Passenger Counters (APC) located over each door of each streetcar vehicle. Passengers are counted as they board and exit the streetcars, and the data collected shows which stops are the most used and which hours of the day are the busiest. The ridership data is downloaded and reviewed daily by a third-party for accuracy, using the same methodology utilized for transit services regionally, and common across the county. During 2016, members from the Ride KC team performed six manual passenger count verification tests, totaling 60 round trips on the system. The the six tests showed the automatic passenger counters (APCs) to be 98.2% accurate (APCs were 1.8% below manual counts). Manual passenger counts continue on a regular basis by a third party. Click here for the full summary of those 2016 Passenger Count Manual Verification Tests.